Read everything, and read it in the order that it is written. If any process is not working, refer to the “Further Problems” section. All processes will take a bit of time. Keep calm and try your best not to get frustrated. Doing any of these processes incorrectly may result in harm to yourself and/or your property. Sometimes you are not as locked out as you think. The doors you have tried might be locked, but that might not be the only way in. This happens more often than you would think. People get overwhelmed and keep themselves from being fully aware of the situation. Keep things simple, and troubleshoot the problem. Begin with the simplest fix and move your way up. Sometimes not all the doors on your car will lock. It is a scary idea, but it happens. Most drivers are most acutely aware of the driver’s side door and neglect the functionality of their other doors. Even if you do believe that all your doors lock appropriately, this might be the instance that they broke. Check all your doors! There may be a way for you to enter the car through the trunk. If you have a hatchback type car, the trunk is not even separated from the cabin of the vehicle. And not always, but sometimes there will be an access point from the trunk to the back seat. This often takes the form of a panel between the back seat that opens when pushed from the trunk. You might want to try this before you go crawling through your trunk, but most people should be aware of their Onstar (or similar company) coverage. In the current new car market, it may be a feature that was thrown in at the time of purchase. Free coverage offers for new cars last about a year. 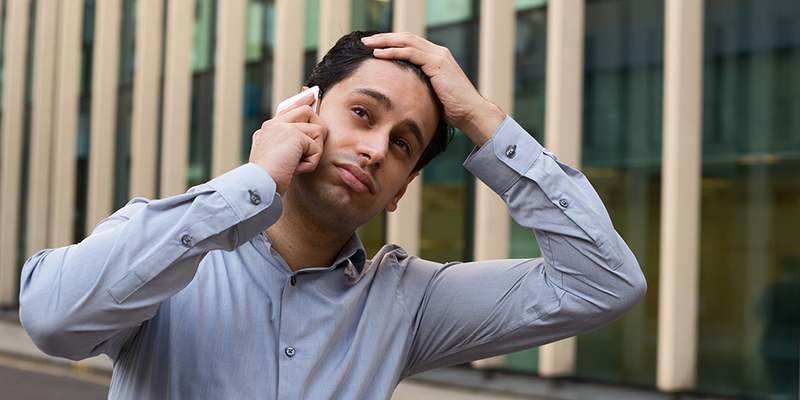 You might try getting in touch with your dealership and seeing if you have it, or if it has run out. All of that phone call bureaucracy will most definitely make you wish you had a trunk to crawl through. If you do have this coverage your doors can be opened remotely. 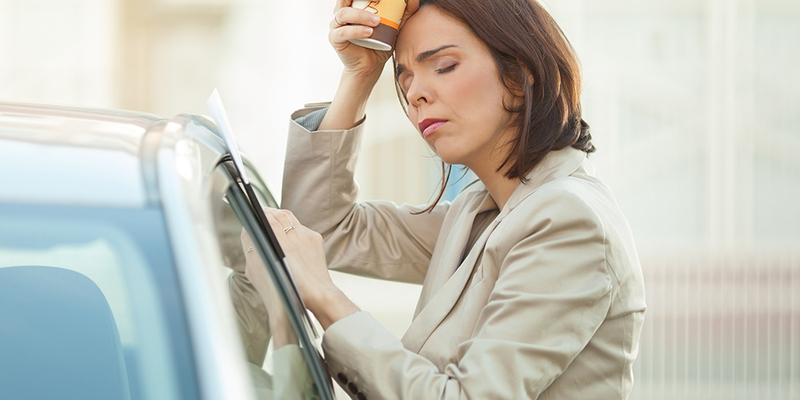 Now that you are sure you are locked out of your car, take inventory of what you have around you. Look for tools that might be able to get you back into your locked car. You do not need the precise items used in the examples in order to be successful with these methods. Materials you find may be better, or create different challenges than the ones discussed below. Find things that have the same characteristics. 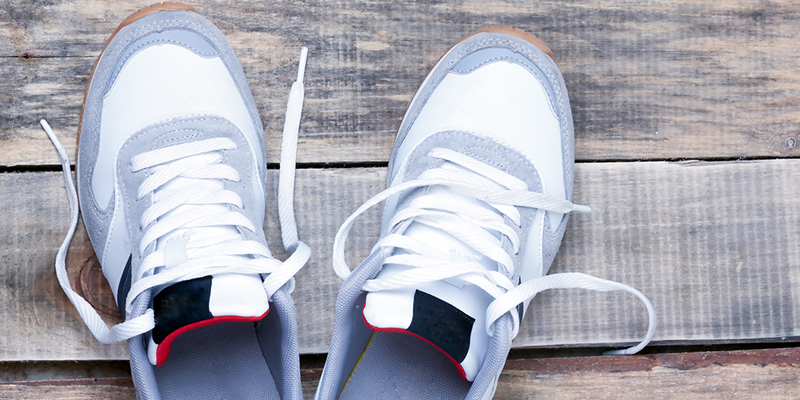 If you have shoelaces, then you have the right tools for the job. This can be done with any string small enough to fit between the car door and the frame. This method will only work on cars with post locks. A post lock is an upright lock that is manipulated by being pulled up (unlocked) or pushed down (locked). Once you have your string, the next thing you will need is a little information on how to tie a slip knot. Firstly, the knot needs to be as close to the center of the string as you can manage. Make a loop five inches left of the center of the string. Make it a little larger than the diameter of the hole formed when you touch the tip of your index finger to the tip of your thumb (size will be adjusted later). Grab the tail end of the right half of the string and move it into the hole (the tail end should be coming out of the hole toward you). Leave the shape loose. This will result in somewhat of a pretzel shape. Keep your thumb and forefinger on the crease of the original loop. The pretzel shape has the original loop and the loop created by tail end entering the hole. Take the tail end back through the hole that it created (the left hole of the pretzel). Keep the pressure on the right end tailpiece of the string and the original loop crease and pull the two parts away from one another. This leaves only one loop. Now by pulling on the left end of the string the existing loop should contract. You can similarly expand the loop by placing your finger in the loop and pulling the loop apart. Now that you have your string with a slip knot in the middle of it, you are ready to open your door. Slide the string in between the frame and the door. Make sure to keep one side of the string parallel to the roof of the car and the other end perpendicular to the roof. Slide the string forward and catch the loop around the lock. Pull the loop closed and pull the lock upwards. You’re in baby! If you’re not, keep reading. Now sometimes our shoes don’t have laces, or maybe we don’t have shoes. In that case, try to find a wire coat hanger. You would be surprised by the number of places you might stumble upon one (see the conclusion of 3 Expert Tools To Open Your Locked Car). If there is a laundromat around, they may have one to lend you. Take into account that you will be disassembling the hanger (perhaps making it unusable). If you cannot get a coat hanger don’t fret. The same methods can be used with any thin piece of strong bendable material. It does not need to bend if it is long, slender, strong, and in the correct shape. If it is not strong, you will need to bend it over to strengthen the ends that will manipulate the locking mechanism. If it is not the right shape, then it will need to be bent to serve its purpose. If it is not long enough, or too thick, it will need to be bent to change these characteristics. Begin by straightening out the hanger. Bend the hook more severely to get a “V”, or check mark shape (adapt this shape as needed). Slip the hanger in between the door and the door frame, “V” first. Try to hook the post lock and pull it towards you and upwards (pulling it towards you will give you some friction on the post). When done correctly the door will open. WARNING THIS MAY DAMAGE YOUR VEHICLE IF DONE WRONG! Straighten the coat hanger except for the hook. Bend the hook more severely to get a “V”, or check mark shape (the small part of the check mark should be around the size of your little finger). Slip the hooked end of the hanger in between the window and the weatherstripping. Turn the hanger inside the door so that the hook is facing toward the car’s interior (while it inside the door). Move the hanger along the window until you see the post move. Once you can identify what part of the door allows you to manipulate the post, begin to pull upward on the hanger (your hook may need to be reformed and bent back into place after a few tries). You should be able to see the post move upward. Keep doing this until the post lock lifts high enough to unlock the door. Bend the end of the hanger in a way that will give you the proper leverage and power to push/slide the lock. You may need to place bends along the length of the straightened hanger in cases. where you need to reach underneath door arm rests. Slip the hanger in between the door and the door frame. If you are working blind, try to get another person to look through the opposite window and guide you. Depress or slide the lock, according to its function. To assist you with any of these processes, you may use a wedge. A wedge can be made out of any material, as long as it is shaped, or can be shaped, into a wedge. Be aware that the material may scratch the paint on your car. You can mitigate this by using a rag or piece of cloth between your car and the wedge. A screwdriver can also be used to wedge the door if one is handy (this poses the largest risk of damage). There may not be any of these materials just lying around, and, in that case, you might need to go to a store and spend a couple dollars. Home improvement stores, auto body stores, and big box stores with general merchandise are you best bet. Similar to #2, these items do not need to be the exact ones mentioned. Any similar object will do. If the keys have been left in the ignition, and the vehicle is still running, it is best to leave someone to watch the car. In the time it may take to make a purchase, a criminal may just open your door and drive away. Auto Body stores may have air wedges or rubber wedges preferred for auto lockouts. If there is no such device try and find a door stop. This can be made out of hard plastic or rubber. A hammer might also be helpful to get the wedge deeper into the gap. A screwdriver can also be used to wedge the door (as previously stated). As long as the home improvement store you are shopping at has a lumber section, it should have a way to cut a piece of wood into a wedge. A wedge alone will not be enough. You will also need to use a probe tool. The probe will follow the same requirements as the wire hanger section. It does not need to bend if it is long, slender, strong, and in the correct shape. If it is not strong, you will need to bend it over to strengthen the ends that will manipulate the locking mechanism. If it is not the right shape then it will need to be bent to serve its purpose. If it is not long enough, or too thick, it will need to be bent to change these characteristics. Depending on what type of wedge you are using, or if you are using a wedge at all, fewer characteristics of your probe will be constricted. This is yet another method that only works on post locks. Big Easy makes a product like this. You will use this tool similar to option 1 in the post lock section of step 2. The plastic strap must be long and thin. The length should be longer rather than shorter, as it must be folded to work properly. The thinness of the material will need to allow it to slip between the door and the door frame while folded. That means that it will need to be at least half the thickness of gap in your door. Sand paper in the crease of the folded plastic strap will help immeasurably. You will try to loop the folded plastic around the post and pull it up and toward you. The plastic will most likely slip off due to the slickness of the materials. To give yourself just a bit of bite into the lock, a fold of sandpaper fastened in that crease will make the process go much quicker. If you have the correct tools and the experience this will work. If you are missing one or both of these things, don’t bother trying to pick the lock. The tools can be anything from paper clips to professional lock picks. Cars from approximately the mid 90’s and before can be picked quite easily. As long as the lock uses wafers it can most likely be raked, rocked, jiggled, single pin picked, etc. Take a look at your key. If you are not sure about what type of lock your car door has, that might be an indication that this step is not for you. The laser cut keys of the modern age might be a little more difficult to manipulate for the average picker. If you are at all questioning your ability, do not try to pick the lock. Breaking or ruining the lock in any way will just make getting back into the car harder for the technician that will need to be called, and it will be very expensive to replace. This method will be similar to option 2 in the post lock section of step 2. The main difference is that the tool will already be made. A slim jim is also more diverse in its abilities than most internet videos will show you. The effectiveness of the various methods will depend on your particular make and model. Be very careful when you are using this tool. There are many wires inside the door, and disconnecting them, or interfering with them accidentally, can cause further complications for your vehicle. This method definitely creates the largest opportunity for you to harm the car. For that reason, the slim jim is the last tool you should attempt to buy. You should also not use it at all if you are not confident in your ability to use it. Your type of car, make, model and the year. More information might be required or requested, but having the answers prepared should relax you enough to give further details. Many police officers are equipped for this situation. Depending on the department and the busyness of the area, they may not come. Certain areas require that the car be running to require police intervention. Because the car is running, you are placed at more risk. A thief will be able to easily spot that the car keys are inside. This means that you cannot walk away from your car. If you feel as though you might be in danger in your current area, then this is a very reasonable option. The reason that this is so high up on the list of options for assistance is because it is an emergency. You should try and use this service if there is a child or animal locked inside. If there is any other type of major complication where you must get back into your car out of fear of bodily harm then you should most certainly call the police. On the plus side, they are not only going to arrive to protect you, and be able to do it faster than any other service, they can also unlock your car. Willingness and availability of this type of service will vary. This may not be the fastest option to getting into your locked car if you can do any of the steps listed above. If you have AAA you can call them to unlock your vehicle. The vehicle locksmith blurb provided on the AAA website says: If the key that operates or provides access to the passenger compartment of the vehicle is lost or broken, service will be sent to gain entrance. If a locksmith is required, services valued up to $50 are covered for Classic members, exclusive of ignition repair/replacement. Services valued up to $100 are covered for Plus members. Services valued up to $150 are covered for Premier members. If the vehicle can’t be safely opened or made operable, or the locksmith cannot replace the key, towing services will be provided under the towing benefit. In the event that your roadside assistance provider is not AAA, you should consult their membership handbook to see if they offer this service. At the very least they should be able to tow your car safely to its destination. A locksmith is going to use the safest and most responsible option from this list. That choice will depend on the situation, the type of vehicle, etc. Provided you have hired a reliable company, your door should be unlocked very shortly after they arrive with no harm done to your car. Do a bit of research to know what to expect when you call a locksmith, and you should be able to detect if the company has the experience and professionalism you need. These problems might complicate any of the steps above. They apply generally to the whole process, but more specifically to some steps than others. It is an addendum to the piece so you can know why the things you are trying might not be working. It also takes into account the inability to take some of the actions required in the listed procedures. BMWs from these years will not open even if you manipulate the door locks and handles. As a security precaution, none of the electronics will work, when the car is turned off. That includes the door locks. If the car has been left running then this should not be an issue. If it is not running, your best chance is to try and wedge the door so that you can retrieve the keys through the gap. This might take a little ingenuity in regards to the shape of the probe. Also, do not make the gap large enough to fit the keys until the keys are ready to fit through the door. A prolonged forced gap might damage the door. When you are using the wedge, also be careful not to stress the window. Too large of a gap can break the window. Picking the lock should also work. Just as the key will open the door, picking the lock will serve the same function. Refer back to the “Picking” section of step 3 before you attempt this. It is always a complicated affair if you happen to have locked your keys in the trunk. When the door is open there should be a button to open the trunk. In the case of the vehicle not opening by unlocking interior locks, it is probably best to call a locksmith. If the technician cannot pick the lock, then they will need to drill a hole in the trunk. This is the absolute last resort! The license plate will be removed and a hole will be drilled behind it. This will expose a wire that when pulled, will unlock the trunk. The keys can be retrieved, and the license plate will cover the hole. You think just because there is nothing in your immediate area, and can’t get on your network, that you get some sort of special secret. If there was an easier way of doing this I would have started with that. You might have to walk a couple miles in your laceless shoes. 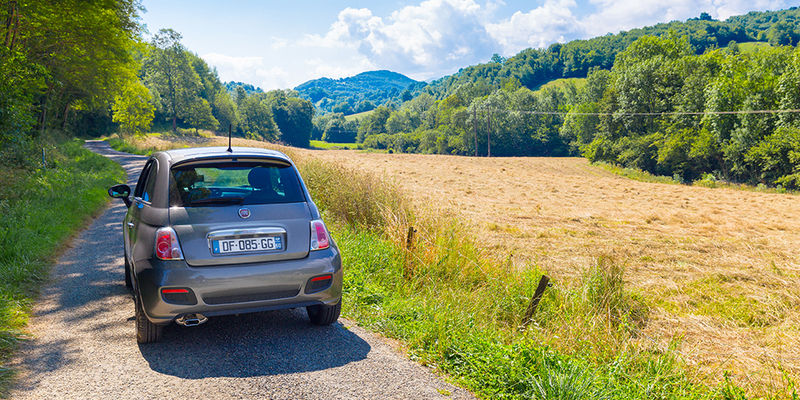 Take inventory of where your car is so you can confidently explain its location to the technician that you call. Head off down the road and try and find an open business with a working telephone. Look for road signs that may indicate what direction is closer. If you are reading this because you are following the rules and reading everything, then good job. I am proud of you, taking the abuse of some slacker looking for simple solutions. Keep on reading, you’re almost done! If you have read the article and put it into action, you will not be locked out for long. Any of these methods alone will solve your problem, but you should always start with the path of least resistance. The trail set by this article should allow you to expend the least amount of energy and money. If you do end up having to get a locksmith or request assistance in some other way, things start to get expensive pretty fast. Don’t let this discourage you. A higher price gives you more control as a customer. The plusses of a cheap locksmith also come with the downsides of a cheap locksmith. Let this experience set the stage for a new era of awareness and responsibility. This might be a good time to invest in duplicate car keys so that you always have a spare readily available. I hope that you found this information helpful, and I wish that you never need to use it again. Share the knowledge with loved ones and friends. Make sure that the people you care about are prepared for situations like this. If you have any further questions, feel free to leave them in the comments section below, and I will get back to you. 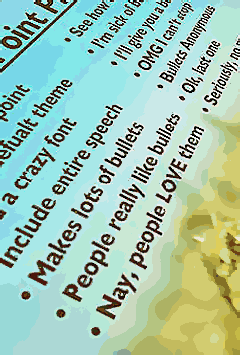 Bullet point • is a pretty popular typographical symbol used to introduce items in a list. And you can type bullet point • text symbols right from your keyboard. I'll show you how to do it by using different techniques depending on your Operating System and tastes. Bullet point • is a typographical symbol or glyph used to introduce items in a list. The bullet symbol may take any of a variety of shapes, such as circular, square, diamond, arrow, etc., and typical word processor software offer a wide selection of shapes and colours. Several regular symbols are conventionally used in ASCII-only text or another environments where bullet characters are not available. Of course, when writing by hand, bullets may be drawn in any style. Historically, the index symbol was popular for similar uses. I'll give you an example of use for clearence. CharMap allows you to view and use all characters and symbols available in all fonts (some examples of fonts are "Arial", "Times New Roman", "Webdings") installed on your computer. You can input bullet point symbols using it. Simple and beautiful way to discover how to add a virtual keyboard for Emoji symbols visible as small pictures. The keyboard itself is preinstalled on your iOS device, so you don't have to download, or buy anything. Character Palette allows you to view and use all characters and symbols, including bullet point signs, available in all fonts (some examples of fonts are "Arial", "Times New Roman", "Webdings") installed on your computer.